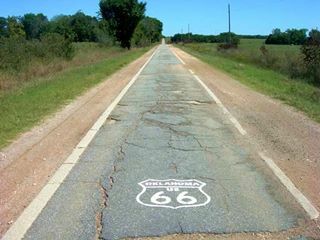 Historic Route 66 in Oklahoma: the Mother Road, Route 66, crosses the state with a northeast to southeast course, joining the Texas panhandle with Kansas. 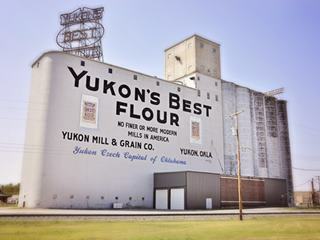 Learn more about Oklahoma and U.S. 66: its history, Sights & Attractions, landmarks and Towns along U.S. 66. as well as places to stay during your road trip across Oklahoma. Area: 69,898 sq. mi. (181.195 km2). Population: 3,878,051 (2014 est.). Time zone (along U.S. 66 alignment): Central (CST): UTC minus 6 hours. Summer (DST) CDT (UTC-5). Motto: "Labor Omnia vincit" (Work conquers all). 28th most populous state in America. 20th largest state in the U.S. Admitted as the 46th state of the Union on November 16, 1907. Route 66 length in Oklahoma is 376 miles (605 km). 3rd longest after NM and AZ. The Native American people, the Choctaw used the phrase "Okla Humma", to refer to the Indians or Native Americans. Paleo-Indians peopled the region some 10,000 years ago. In historic times, the Wichita, Caddo, Osage and Quapaw lived there and during the 1800s, groups like the Choctaw and the Cherokees were forced to relocate in Oklahoma. The Spanish explorer Francisco Vásquez de Coronado explored the area in 1541, which became part of the French Louisiana until it was acquired by the U.S. in 1803. The original Indian Territory formed after 1831 was gradually carved up by white settlers, railway rights-of-way and land taken by the Federal government. The Indian reservations were redrawn and land was opened for settlement. Land Runs were organized: those who arrived first picked the land they chose. And those who arrived before the official opening date, did so "sooner", and this led to the state's nickname: "Sooner State"
The "all-Indian" state project failed and the territory became the 46th state in the Union in 1907. The tragic Oklahoma City terrorist bombing of April 19, 1995, destroyed the Federal Building in that city, killing 168 people, including 19 children. The relatively flat topography of Oklahoma has a slope from west to east and an average height of 1,300 ft. (400 m). Oklahoma is located on a geologically stable region and there are no volcanoes in the state. Earthquake risk is low. The open flat region of Oklahoma is subjected to the influence of the humid air from the Gulf of Mexico, the dry and hot air from the west and the cold and dry air from Canada. This combination leads to fluctuating and extreme climatic conditions: Oklahoma is located on the "Tornado Alley and is hit by an average of 62 tornados each year between April and June, which is one of the highest in the whole World. The climate is humid and subtropical in its central regions. It rains all year, with higher precipitation during late spring and summer (around 5 inches 13 cm), with thunderstorms during this period. Summers are hot and winters mild (but as mentioned above, cold spells with snow or freezing rain are common too). Oklahoma City experiences around 3 in. of snow monthly in winter. 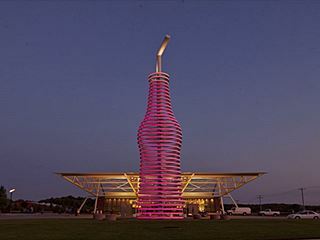 Oklahoma City is the largest city along Route 66 in the state (Pop. 599,199 in 2012) and a Metropolitan Area of 1,252,987. It is followed by Tulsa (Pop. 393,987) and a Metropolitan area with 937,478 residents. Around 553,000 people live along Route 66's corridor through Oklahoma. Oklahoma is a Southern state and the typical southern hospitality prevails. During the Dust Bowl period in the 1930s the migrant Oklahomans were referred to as "Okies". 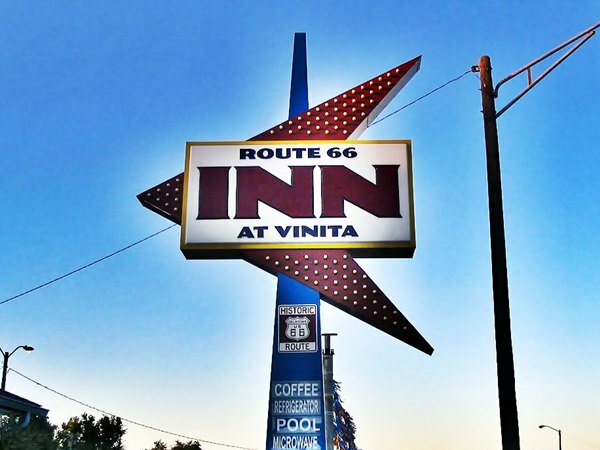 The towns along Route 66 offer different lodging options. 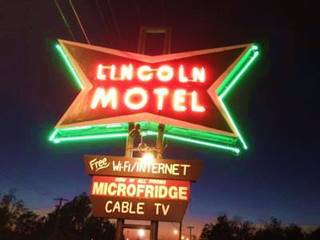 Check out hotels and motels in the main towns. 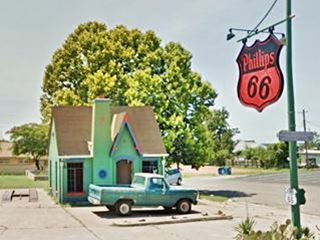 It has the the location of each village, city and town linked to their webpages with full details on attractions, sights, Route 66 icons and more. 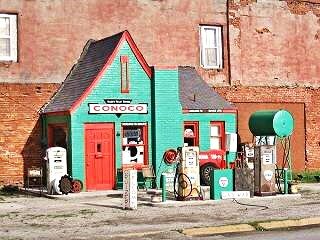 You can drive almost the full length of Route 66's alingment in Oklahoma, and see many interesting historic landmarks and vintage US 66 icons. Below are the pages on each city along Route 66, click to find out about their attractions, sights, weather, history and where to stay. 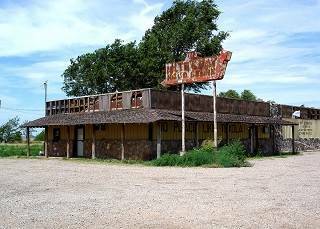 Below we list the main attractions along Route 66 in Oklahoma, there are many more. They are listed from east to west. Detailed description of the alignment of U.S. 66 through Oklahoma, from East to West. For each town we give details of Route 66's alignment through it, so click above on a town and read more about the course of US 66 in that specific town. Route 66 crosses Oklahoma from its Northeastern tip, to its western central area, passing through Tulsa and Oklahoma City. A detailed description of Route 66 as it crosses the state of Missouri, sights, attracitions, towns and places to see. From the Kansas state line (mile zero), follow Alt. US 69, which passes through Quapaw (5 mi.) turns west and joins US 69, and as such runs westwards to Commerce (10 miles). It turns south through the town as Mickey Mantle Blvd. (the 1920s alignment took a right on D St. and another on Main St. meeting current alignment south of town). US 66 takes a southwards course as US 69, passing through the center of Miami (15 mi.) along its Main St.
Visit the Miami Marathon Oil Company Service Station and the Coleman Theater, Historic Places. If you keep on south along the Main St. it becomes the "old" alignment of US 66 known as the "Ribbon Road", which runs between Miami and Afton. Keep south till 3rd Ave. and take a right along Route 66 (US 69), westwards, crossing the Neosho River, and passing through the tiny town of Narcissa, don't miss the 1922 Ribbon Road only 9 feet wide, see the monument, on E-140 North of the town. Keep south, cross I-44 -Will Rogers Turnpike, Toll Road (27 miles) and US 60 to reach Afton (30 mi.). US 66 continues with US 60 south and then takes a sharp curve to the west (35 mi.). It then crosses I-44 (Exit 249) and enters Vinita (45 miles). Route 66 goes through the town turning SW along Wilson St. (US 60 & 69). US 69 splits to the left and US 60 to the right (49 and 50 mi. ), keep straight along OK-66 highway through White Oak and Chelsea (63 mi.) with its Historic site, the Chelsea Motel. OK-66 adopts a SW course through Bushyhead (69 miles), and Foyil (72 miles) where you should stop at the Ed Galloway's Totem Pole Park, a Historic Site. Keep on OK-66 passing by Sequoyah and reaching Claremore (82 mi.) where you can visit the Will Rogers Museum and and its "radium water baths", after crossing the town of Verdegris, and Verdigris River you will reach Catoosa. 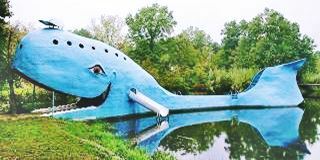 Don't miss the Big Blue Whale (right by the highway, 92.6 miles). Leave the town behind and take a left on N 193rd E Ave (Co. Rd. 167) passing I-44 and turning right on E 11th St. (96.3 mi.) towards Tulsa. OK-66 runs with a westerly course, crossing I-44 and US 169 and US 75 (109 miles), entering the center of the city of Tulsa via E 10th St.
Tulsa has three historic sites on the National Register: The Circle Theater, Vickery Phillips 66 Station and 11th Street Arkansas River Bridge. Follow OK-66 as it forks on the left at S. Denver Ave., crossing US 75 & US 64, heading towards the Historic bridge across the Arkansas River as Southwest Blvd., keep along this road as it crosses US-75, and then I-244 to its northern side (113 miles), leaving Tulsa behind. SW Blvd which later becomes Frankona Rd. will run to the north of I-44, and cross again, to its southern side (122 mi.) to merge with OK-66 and head south through Sapulpa, which it enters via OK-33 (E. Dewey Ave.) taking a sharp right turn. The Bridge #18 at Rock Creek is a Historic Site. Stay on OK-33 until it forks right towards I-44, then carry on straight along OK-66 through Kellyville (131 miles). The Route 66 crosses to the north side of I-44 (137 mi.). It departs from the interstate, heading west. But then turns south, crosses I-44 and enters Bristow (145 miles) down its Main St. It takes a right and leaves the town along W 4th Ave. Stick to Route 66 as it heads west and reaches Depew (153 mi.) and then, on the south side of I-44, Stroud (164 mi.) 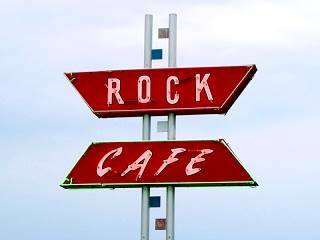 along its Main St.; don't miss the Rock Cafe, a Historic Site. Follow Route 66 west to Davenport (171 miles) and Chandler (177 miles); visit the Chandler Armory, a Historic Site. Follow OK-66 west, passing through Warwick (185 mi.) and its Historic Seaba Station. 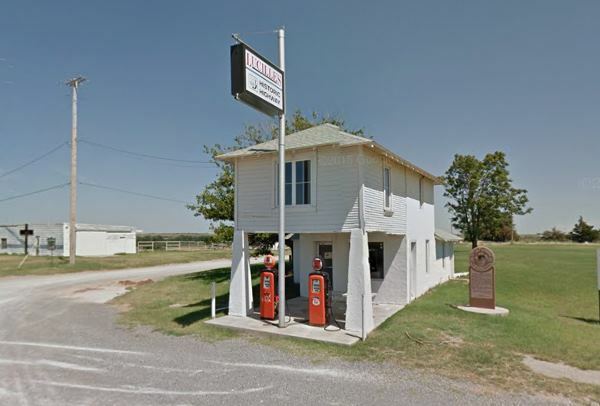 Just west, it crosses to the north of I-44 (188 miles) going by Wellston with a western course & going by Luther (197 miles) with its Historic Site, the Threatt Filling Station and reaching Arcadia (205 mi.). 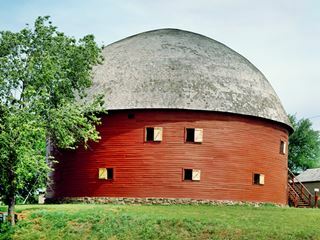 See the Round Barn, a Historic Site, and also, the modern architecture of the Pop's Restaurant. (After Coffee Creek, on the left you will see Pop's). Keep straight ahead and cross I-35 (at its Exit 141) heading west along the original alignment of US 66, which is current US 77. 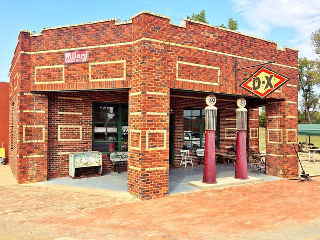 Go through Edmond and in its downtown area, take a left along Broadway (214 miles) following US 77 into Oklahoma City. The town's name is mentioned in the song Route Sixty-six (Get your kicks...). Leave US 77 at N. Kelley Ave. Exit (217 mi. ), cross to the south of US 77 and head south along N. Kelley Ave. until reaching I-44 (222 miles). Then get onto it at Exit 128B westbound and immediately leave it to the right at Exit 128A, onto N. Lincoln Blvd., southbound. This road will take you straight south right into the center of the city, by the State Capitol (225 mi.). Follow Lincoln Blvd., to the right and take a right turn along NE 23rd St. until reaching N. Classen Blvd. (227 miles), turn right along the Boulevard heading north. At NW 39th St. take a left and head west (228 mi.). After N. Young Blvd, a right will take you under I-44 to its north side, then take a left along its North Service Road and get onto I-44 at Exit 124, heading west; leaving I-44 (which turns left) and following straight along NW 39th Expwy. (Route 66), which passes by the north shore of Lake Overholser, on the North Canadian River, using the Lake Overholser Bridge, a Historic Site. The road reaches Yukon (240 miles). Keep west, US 81 joins Route 66 the left and head north, into El Reno. 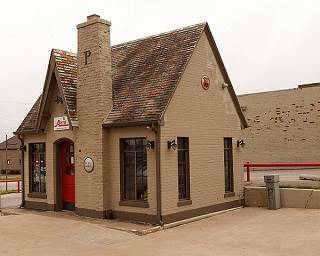 Stop by the Historic Sites: Avant's Cities and Jacksons Conoco Service Stations and Fort Reno. The road goes through its center along US 81 and OK-66. At Sunset Dr. (254 miles) take a left leaving US81, and head down Sunset Dr., which is also I-40 Bus. Loop. westwards. Take a right along E1020 Rd., (258 mi.) which is Route 66 (signs say Fort Reno Visitor Center and also the brown shield of US 66). Head west along it, it runs to the north of I-40, and crosses US 270 (263 miles), the old 1920s alignment of Route 66, took a right here, passing through Calumet (5 mi to the north), and Geary, joining the later alignment further west, at Bridgeport, you can drive the 1926 loop or keep straight, westwards. At US 281 Bus, take a right (270 mi.) until Jones Rd. NW, turn left, to the West, (272 mi.). You will meet US 281 (274 miles); turn left, to the southwest. The road (also OK-8), takes a westerly course and passes just south of Bridgeport (280 mi.). The road becomes the North Service Road of I-40 (290 miles) and passes by Hydro (291 mi. 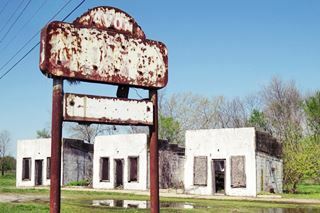 ); visit the Provine Service Station (Historic Site). Continue west along the I-40 Service Road and reach Weatherford (298 miles), along E. Main St. Take a right along E. Main St. (I-40 Bus Loop) into the town and leave town along S. 4th St. The road turns west (OK-54) and again runs west as the Frontage Road of I-40, crossing to its south side at Exit 71 (309 mi. ); keep a westerly course until N2290 Rd, where you return back to the north side of I-40 (311 miles). Keep west, it is I40 Bus. Loop, and enter Clinton (314 mi.). It has two Historic Sites: McLain Rogers Park and Y Service Station and Cafe. The road goes into the town along W. Gary Blvd., and then enters I-40 westwards at Exit 65, west of the town (317 miles). At Exit 62, leave I-40, and get on its south side, head west along the Service Road, (319 mi.). At Exit 57, cross to the north of I-40 (324 miles), keep along the Service Road, reaching Foss (328 mi. ), cross to the south at Exit 50 and enter Canute (335 miles). Once again cross to the North side of I-40 (N2050 Rd) (338 mi.) and head west into Elk City, cross OK-34 and turn left and then right along I-40 Bus Loop, through the town (341 miles). The road rejoins I-40 at Exit 32 (350 mi. ); keep along the service road, west. And at Exit 25, turn again right along I-40 Bus Loop. into Sayre (359 miles). At its 4th St. take a left passing through the town (see the Beckham County Courthouse, a historic site). When you reach I-40, stick to its North Service Road (362 mi.). Head west. U.S. 66 passes through the ghost town of Hext and then to the south of I-40 at Exit 20 (371 miles) to then turn west and enter Erick along Roger Miller Blvd. (375 mi.). See the historic West Winds Motel. Keep west along Route 66 after I-40 Bus Loop turns north, stay on E1240 Rd. all the way to Texola (382 mi. 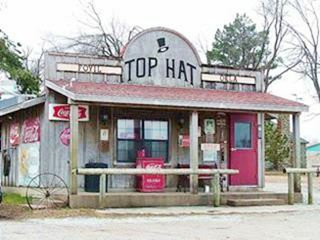 ), the last town in Oklahoma along U.S. 66, pass through it along 5th St. and leave the small town along OK-30 which turns to the northwest and crosses the State Line into Texas (383 miles). At the Texas state line, the road will become Spur TX 30 and head towards I-40.